I love the muffin so much that even when I'm just passing by a Kenny Rogers restaurant, I'll be sure to buy at least one corn muffin to munch along the way. Therefore, I have totally no idea what took me so long to finally decide that I should try recreating the muffins at home! So here's my own version of the recipe for all the Kenny Rogers corn muffin fans! (8) Lastly, add the corns and mix well. (-) It can be quite a challenge to find yellow cornmeal in Singapore. Nevertheless, it can be found in the more upmarket supermarkets such as Jasons Market Place or certain Cold Storage outlets (such as Yishun). 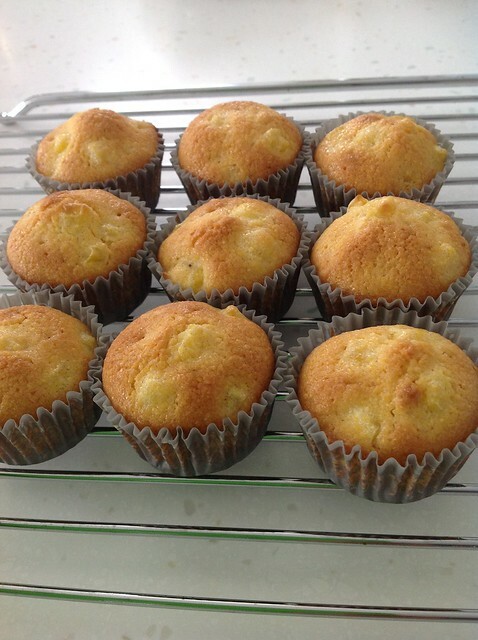 (-) If you were to replace the cornmeal with polenta, the muffins will have a more textured taste to the bite since polenta is coarsely grained cornmeal.